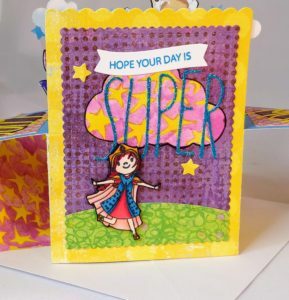 I just love the new Seekers of Justice stamp set in the summer release from Beth Duff Designs! 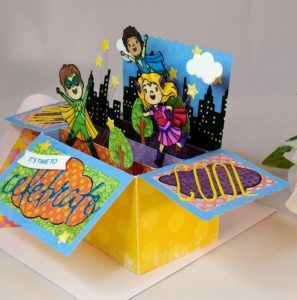 The adorable super heroes were begging for a card that would let them jump off the page and since I’m totally smitten with box cards, I decided to team them up! 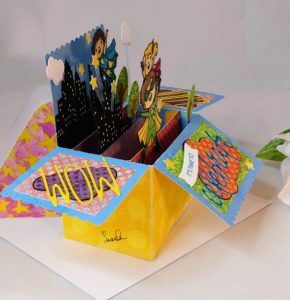 Lawn Fawn has a die that makes box cards very easy to cut out and assemble. Folded flat, they fit into a standard A2 envelope. If you use double sided pattern paper like I did here, you can quickly get to the fun part of decorating them! 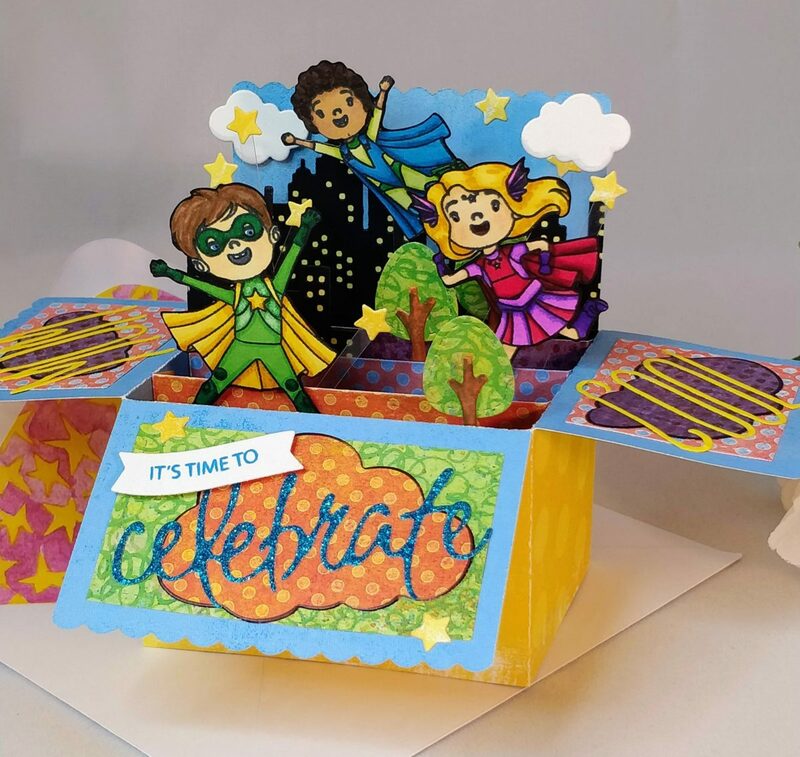 I chose glitter cardstock to cut my sentiments from and pattern papers that have a comic book style for the the box pieces and decorative mats. Dies from Lawn Fawn, Mama Elephant, Penny Black, and Waffle Flower help create the cityscape and sentiments for my characters. To give the sentiments some comic book flair, I layered cloud dies under the letters; they look like cartoon puffs of smoke if you cut them out of bold prints and outline them with a black marker. When assembling the scene, foam tape and clear acetate strips help add further dimension and the ability to make elements float in the air. Just be mindful of your envelope dimensions and the way the card folds when placing elements. You want the card to fit inside the envelope when you are done. As a final touch, I lined my envelope with a scrap of leftover pattern paper. (Remember the rule of thumb for envelopes, they shouldn’t be naked but, they also shouldn’t give everything away before the recipient sees the card inside.) So what do you think? Have you played with box cards yet? Do you love them as much as I do?! On behalf of the design team, I am so happy you stopped by! 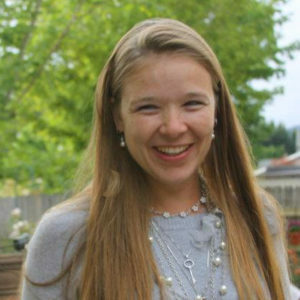 Be sure to check out all of projects in the Beth Duff Designs’s Summer release blog hop! The new stamp sets are so adorable and we can’t wait to see what’s on your must have list. Please join us and visit each page in the hop. By leaving a comment on each of the blog posts, you will automatically be entered to win a coupon for 15% off your purchase on duffsdesign.com! This contest is open to both US and international fans. Thank you so much for joining us, and make sure you join us on Facebook to share your own projects and see what else our team comes up with! I love the box card! That really is a super box card 👏 All those bright color and characters . Great job . Is it hard to get the inside pieces to fit right ? Does the lawn fawn set have all the structure pieces to make the box card or does it require multiple sets ? Thank you for your post . Thanks! The Lawn Fawn die set has everything you need for the structure and a few scene building pieces too. Just a few strips of strong adhesive tape (or wet glue) and you’re in business! The struts line up perfectly, so assembly is very easy.